The original Spanish name for our beloved Key West is actually Cayo Hueso. In English, it translates into “bone cay,” which means a low island or a shallow reef. At the time, it was said that the island was originally covered in human bones of the past native inhabitants of the island. They had used the island as a communal burying ground. In fact, Spanish speaking people who live here still use the name Cayo Hueso when referring to Key West. 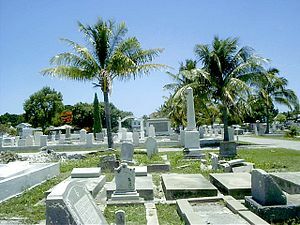 Our modern Key West cemetery. 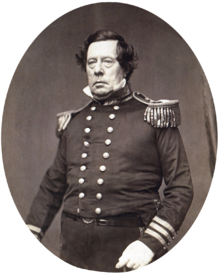 Commodore of the US Navy, Matthew C. Perry, sailed the schooner Shark to Key West on March 25, 1822. He planted the American flag on our island and claimed the Keys as the property of the United States. After this, there were no disagreements or protests over America’s claim to Key West. So we then became the official property of the United States. We’re so glad to be apart of America! Our advertising agency recently was tasked with designing some ads for so recycling bins we had purchased. Watch the video to see what we got. Doctor Samuel Mudd was the doctor who set the broken leg of Abraham Lincoln’s assassin, John Wilkes Booth. As a consequence, Mudd was convicted of conspiracy since he helped Booth. 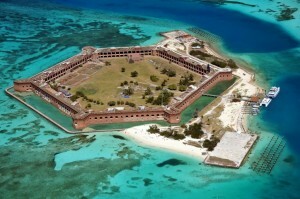 He was sent to Fort Jefferson, which is located about 68 miles off the coast of Key West on Garden Key in the Dry Tortugas. Take the Yankee Freedom III to the Fort and explore the place where Mudd was held and go snorkeling around the fort! You are currently browsing the Old Town Trolley Tours Blog blog archives for November, 2013.